The cabin was great! Our family of 6 had a wonderful time! We enjoyed snow skiing, snowboarding and snow tubing. We also went trout fishing, hiking, waterfalls, downtown and sightseeing. We love that the cabin is so close to many activities. Thanks for giving our family an amazing vacation. This first Smokey Mountain cabin served our family so many firsts, it's hard to keep track. We are so thankful and blessed to have been part of this time in Bryson City. Loved the Hot Tub! Will forever be held in our hearts so dear. Had a great weekend. What an amazing area. The cabin proved to be more than we expected. We are already looking forward to our next trip here. Limited verbal communication but emails were very detailed and clear. Simple cabin, quiet remote location but surprisingly close to town. Very comfortable for a family of four. Perfect for what we needed. We loved the hot tub and the porch. We had a wonderful time. We went tubing at Deep Creek. It is such a beautiful and relaxing area. The waterfalls are awesome. We also went white water rafting and zip lining. We also went to Sliding Rock. My family loved relaxing at the cabin. It was a great family vacation. Great Weather! Great Hiking! Loved the Cabin! Lovely getaway with so much to do so close by. Hiking, tubing, rafting, zip lining and fishing. Great Vacation. We enjoyed having this little cabin as our home for the week. Deep Creek tubing, Nantahala Rafting, Ice Cream in town and the hot tub for sore muscles! Great Mountain Getaway! Everything went very smoothly. The directions you sent on finding the cabin and operating the lockbox were clear and easy to follow. Also, the onsite turkey greeters we quite entertaining! We really enjoyed our stay. Beautiful cabin with fun outdoor and mountain decorations. Even with the weather being rainy we still got out and hiked, exploring, shopping and generally taking in the laid back NC atmosphere. Loved the Peace and quiet of your beautiful cabin. Great place to stay to getaway for the weekend! We went white water duck rafting and it was only 20 minutes away. A great getaway! Wonderful place for a honeymoon. Lost in a tree house. Nearby hikes were fantastic. Can't wait to come back with family. We had a blast. Great stay and a great location, exactly what we needed. Highly recommend! 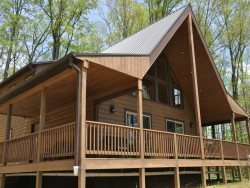 Cabin is in an excellent location, conveniently close to Bryson City on a secluded, peaceful mountain. We went to Mango Falls and the three falls at Deep Creek area. They were all so beautiful and we enjoyed the loop hike. Bryson City and the downtown area is so beautiful. We loved it. Simple and comfortable. Close to Bryson City downtown and NOC. Steep entry, but doable. Great to be able to bring our dog! Thanks! Love the simplicity, but super comfy! Also nice to be able to bring out dog! We had 2 beautiful days on the river. Many thanks for the perfect spring break.